Happy New Universal Singapore Photos! In May 2009, a string of freak fender benders broke out in the general vicinity of the Western Washington Fairgrounds in Puyallup [pronounced Pew-allup]. The culprit was not cell phones, sleepiness, or any of the other usual suspects. It was a roller coaster--one missing a 100-foot wide section of its structure, to be exact. Unbeknownst to these unfortunate gawkers, what they had witnessed was the beginning of a three-year, $1 million dollar project to completely rebuild the fair's classic wooden coaster. Coaster Thrill Ride--also known as "Giant Coaster" or simply "The Coaster"--has served the Puyallup Fair reliably and safely for nearly 75 years. But time and weather have taken their toll, and by 2009 it had become clear that drastic measures were in order. Fortunately, John Hinde was up to the task. An industry veteran, John welcomed the challenge of overseeing this daunting project with open arms. He and his crew from J.P. Hinde Enterprises, Inc. began doing surgery on the coaster in early 2009, and have been working diligently to restore this wooden beauty to her former glory. I recently had a chance to chat with John about the renovations, and I'm thrilled to bring you a detailed look at this exciting endeavor. Editor's Note: Unless otherwise noted, all photos appearing in this article were taken by John Hinde and provided courtesy of J.P. Hinde Enterprises, Inc. 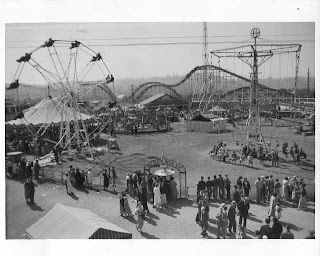 Ever since it was built in 1935, Coaster Thrill Ride has been the centerpiece of the Puyallup Fair. Generation upon generation of local residents will attest to that. "There's a lot of people who come to the fairgrounds and about the only ride they'll ride is the coaster, because it's something they grew up with," John noted. The coaster was designed by the legendary John Miller and built by Edward H. Bollinger, a Swiss immigrant who also operated a kiddie airplane ride and a Ferris wheel in the area. Since then, it has been partially rebuilt on three separate occasions to repair fire damage and address various other maintenance concerns. Coaster Thrill Ride began its life as a side friction coaster, utilizing rolling stock designed by another industry legend, Fred Church. Around 1950, during one of the rebuilding efforts, it was redesigned to support an underfriction (i.e., "up-stop") wheel arrangement. It was at this time that the coaster began running the three beautifully minimalistic trains that are still in use today, also of Church origin. They are said to be the only Fred Church trains still in operation. What a claim to fame! Certainly, this coaster's historical significance is a large part of its lure. But perhaps that lure is also attributable to the fact that the window of opportunity for riding it is so small. Coaster Thrill Ride operates for a grand total of 21 days per year--17 days during the larger Puyallup Fair in September, and 4 days during the spring fair in April. Over the years, this limited operating schedule has proven to be more than just an inconvenience for enthusiasts; it has also invited rot to creep into the aging wood. As John explained, the construction methods used in 1935 were quite a bit different than those used in building modern wooden coasters. The lumber was not treated. The laminated track pieces were not glued together. Heck, this coaster doesn't even have footers! When you combine these factors with a rainy Pacific Northwest climate, structural damage is inevitable. "Up until the '90s, they only ran the one fair in the fall every year, so the ride just sat there for ten or eleven months soaking up water," John noted. As the relentless rains continued to seep into all the nooks and crannies of the exposed wood, the pieces eventually began to rot from within. Needless to say, this presented some maintenance headaches. John's company has been conducting ride inspections at the Puyallup Fair since 1988 and assisting with the maintenance of Coaster Thrill Ride for nearly as long, so they have witnessed the degradation of its structure firsthand. Repair work began in earnest in the '90s, but quickly proved to be nothing more than a bandaid solution. Additional bracing was added in some areas, but this tactic resulted in greater forces being exerted upon the areas which were not reinforced. In many cases, the same repairs had to be made multiple years in a row. It was a vicious cycle. And vicious cycles aren't cheap. "It just got very, very expensive tearing sections apart and putting them back together," John said. 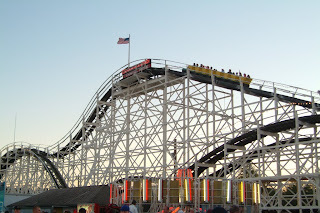 Ultimately, the coaster's owners had a decision to make: Rebuild the classic woodie from top to bottom, or scrap it altogether and replace it with a different ride. Local residents and coaster enthusiasts alike rejoiced when the decision came down to save it! John surmises that Coaster Thrill Ride's historical significance, which has been further underscored by the legions of enthusiasts who have descended upon the fair to photograph, research, and ride it in recent decades, weighed heavily in this victory. The sheer popularity of the ride among fair patrons didn't hurt, either. From both a historical and a financial perspective, the decision just made sense. The repair costs will be split evenly between the Western Washington Fair Board and carnival outfitter Funtastic Traveling Shows, who co-own the ride. When I say that Coaster Thrill Ride is being rebuilt from top to bottom, I'm not just whistling Dixie. Literally every square inch of this coaster will have been touched by John & company's capable hands by the time it's all said and done. Starting from the bottom, the new and improved Coaster Thrill Ride will be footerless no more. Not only will these new foundations strengthen the overall structure of the ride, but they will also help to prevent against future wood rot. As you might imagine, it's a lot easier for water to invade a structure when it's simply sitting on the ground. Then there's the matter of all that rotting wood. Each and every piece of the aging Douglas fir will be replaced by southern yellow pine--treated southern yellow pine, thank you very much. (Take that, Mother Nature!) 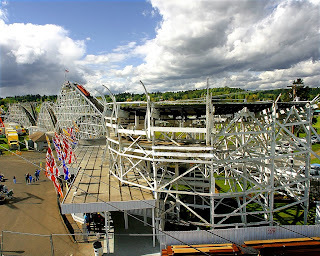 Douglas fir was used in the initial construction of the coaster due to its prevalence in the region, and John would not have been opposed to using it again. But the majority of today's coaster engineers prefer the density and flexibility of the pine, so pine it shall be. Ironically, even with the rot, Coaster Thrill Ride's original wood afforded some benefits that today's lumber cannot match. Simply put, the quality was just better back then. "Back then when you got it, it didn't have any knots," John said. Through the years, deforestation and an inability to keep up with modern building demands have forced the industry to relax its standards for structural content. Consequently, today's structural grade lumber may have quite a few knots in a 20-foot length of board. The result? More (and bigger) wood is required to do the same jobs. Among other things, John's crew is putting in full-size 4x8 legs, whereas the original construction utilized 4x6 legs. The upgraded bracing system will also appear more prominent to onlookers, as the layers will be placed six feet apart as opposed to the original ten-foot spacing. "That's taking in all the design factors to provide the same structural integrity as they did with wood from back in the '30s when it didn't have knots in it," John explained. The connections will be strengthened as well, as the crew will be bolting many sections together which were previously attached using only nails. And finally, for good measure, the laminated track pieces will be glued together. With all the upgrades being made to the structure, it's only fair that those vintage Church trains get a little TLC too. Thus, the final step in this massive project will be a complete rehabilitation of the rolling stock. The only question is whether that rehab effort will also include a rebuild of the chassis to accommodate fin brakes. John is fully aware that the very mention of converting Coaster Thrill Ride from a skid (i.e., friction) braking system to a newfangled fin braking system will strike outrage in the hearts of many an industry preservationist. Trust me, he is quite sensitive to this concern! But from a safety and efficiency standpoint, he feels that he would remiss if he didn't at least consider it. The slide incurred with the current "old school" braking system forces the fair to switch to a one train operation anytime it rains to ensure that there is zero risk of one train colliding with another. "The brakes work absolutely fine on a good dry day when there's no problem with impeding the friction value," John said. "But when you start getting moisture on the track, the old metal skid brakes don't stop the train like the fin brakes would. But it's operated all these years without any problems at all, so it's just a matter of whether you want to keep it as safe as possible and not cause a problem." In addition to the obvious safety concerns, there is the matter of operational efficiency. As Coaster Thrill Ride is the most popular ride at the Puyallup Fair (and thus one of their key money makers), they can ill afford to reduce its capacity due to a little rain. And as you know, it occasionally rains in the Pacific Northwest. [See previous remarks regarding the coaster being overrun by moisture-induced wood rot.] This matter, however, is far from being settled and will be largely dependent on the overall budget for the project. Whatever happens, I guarantee you that John will not take the decision lightly. "That status of maintaining the ride as it was means quite a bit," he told me. To you and me, the scope of this project is tremendous. But it's all old hat to John. His first foray into the wonderful world of wooden coasters came at Cedar Point in the '60s, when he worked alongside the great John Allen during the construction of the Blue Streak. 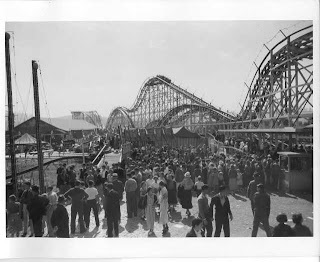 He credits Allen, whom he refers to as "a grand gentleman", with sparking his interest in wooden coasters. 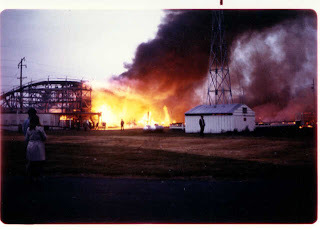 That interest ultimately led to some exciting projects, not the least of which were rebuilding the Swamp Fox at Family Kingdom after it was ravaged by Hurricane Hugo in 1989, and relocating Circus World's Florida Hurricane to Magic Springs & Crystal Falls, where it continues to thrill riders as Arkansas Twister. What keeps the Puyallup job challenging for John is the fact that the coaster must be operational during fair times. "If you can tear the whole thing down at once, it's a lot easier," he noted. But the fair can't afford to have its star attraction down for the count, and as a result, the rebuilding effort must be executed section by painstaking section. This method of reconstruction necessitates connecting the new with the old, which is easier said than done when you're dealing with two completely different types of wood. "Where you match the pine lumber to the Douglas fir, you've got a difference in contraction and expansion rates," John explained. "So that's something we have to keep our eye on in the springtime and in the fall when we're operating it. If we get a real hot day or a real cold day, there's going to be some situations where you could have some expansion and contraction problems that could add a little bumping in the track and things like that." Needless to say, the crew is taking extra precautions in these areas to ensure both safety and stability. This challenge, combined with the fact that regular maintenance must continue as usual on the older sections of track, may extend the project's timeline beyond its originally proposed three-year schedule. But the encouragement from fair patrons who had the opportunity to experience this unique "patchwork" woodie during the 2009 fall fair makes it all worthwhile. The sheer quietness of the trains as they traversed the new track was noted, and because those sections are now gauged 100% correctly, they do not produce the "shuffling" (i.e., side-to-side motion) experienced on many of the older sections. A pleasant side effect of this improvement is increased speed. John predicts that the entire ride will be slightly faster after the renovations are complete. In case there were any Puyallup residents who were not aware of the renovation effort by the time this year's fair rolled around, I daresay Coaster Thrill Ride's current "color scheme" probably gave it away. The classic white supports of the older sections, peeling and chipping though they may be, stand in stark contrast to the natural wood of the new sections. At this point the Fair Board is split on whether to slather those new boards with a coat of traditional white or leave them "au naturel". But as John noted, they have plenty of time to decide. Today's treated lumber contains quite a bit of moisture, and as such, the new sections will need to "dry" for a good year and a half before any paint can be applied--if it is applied. As evidenced by the initial rash of gawking-induced accidents, the renovation of Coaster Thrill Ride has proven to be positively fascinating to onlookers. Locals and enthusiasts alike frequently stop by to check on their "baby", and John enjoys the dialogue. "We never have to worry about people keeping an eye on the job," he joked. The Western Washington Fair Board and Funtastic Traveling Shows deserve a lot of credit for recognizing the significance of this coaster and committing the faith and funds required to restore it. Likewise, John and the rest of his crew from J.P. Hinde Enterprises, Inc. deserve a lot of credit for the blood, sweat, and tears they continue to pour into this job on a daily basis. Their meticulously executed handiwork stands as testament to their wholehearted commitment to wooden coaster preservation. Thanks to the combined efforts of all parties, we can look forward to riding a restored and rejuvenated Coaster Thrill Ride for many years to come. I'd like to sincerely thank John Hinde for taking time out his busy schedule to discuss this exciting project with me, and for providing so many fantastic construction photos for us to enjoy. I'd also like to thank Karen LaFlamme, Public Relations Counsel for the Western Washington Fair, for facilitating this interview and providing all the historical fair photos. For even more coverage of Coaster Thrill Ride's facelift, be sure to check out Roller Coasters of the Pacific Northwest. On the Gallery page, you will find many more construction shots for your viewing pleasure!